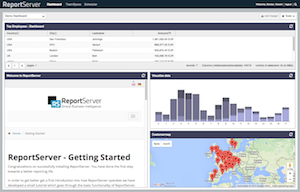 We are thrilled that you decided to give ReportServer a try. With this tutorial we want to give you a short introduction to our demo system and it should lead you step by step through the most important functionality from the perspective of end users. Wait for a minute or so, once the terminal returns, reload your browser window. This account will give you broad (although read-only) access to the system and allows you to explore almost all areas or ReportSever. Of course, if you have installed ReportServer locally then you can use the super user account that you specified during installation (default is: root/root) to get full access to ReportServer. Our demo system simulates the reporting platform of a toys retailer. The data originates from the Eclipse BIRT Sample Database and was adapted by us to form a small data warehouse; that is, we mainly aggregated information according to different keys into aggregate tables. In addition we have created several reports which we will introduce in the following sections. The organizational chart of our fictional enterprise is also based on the Eclipse sample data. On this basis we have introduced departments and divisions each with access to reports regarding their area of work. 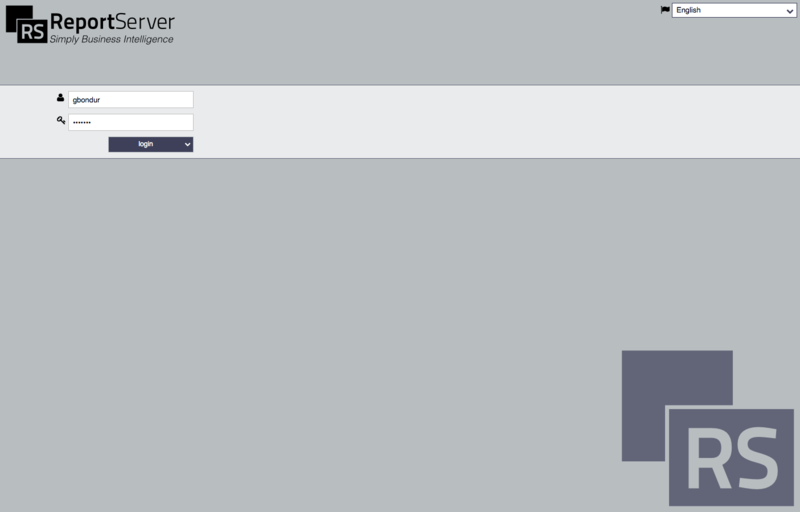 In the course of this introduction we will assume the position of different users to introduce the various aspects of ReportServer. Gerard Bondur is a sales person and responsible for the regions Europe, the Middle East and Africa. After logging into the system you'll find yourself in the dashboard module. Gerard has a single dashboard with four dadgets (short for DAshboard gaDGETS). Dashboards allow to create a page (or multiple pages) which contains aggregated information such that, for example, key performance indicators are visible on a single glance. 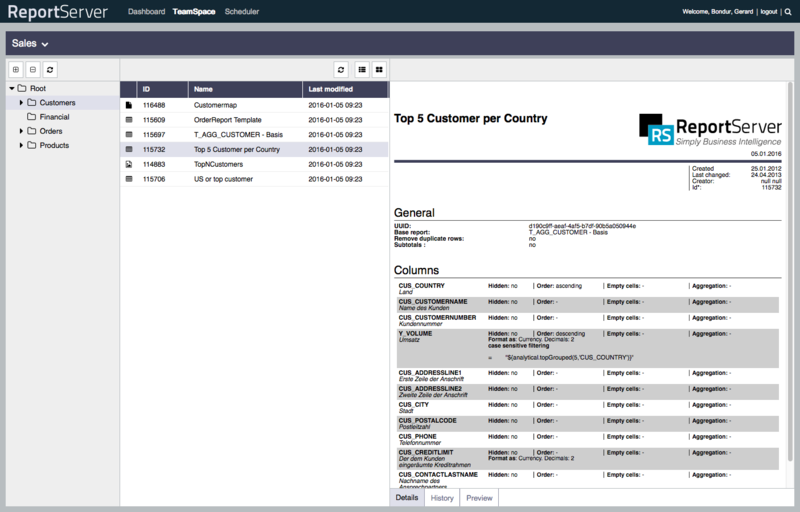 Users, such as Gerard, manage dashboards themselves. Alternatively they can choose to include dashboards created by an administrator. In our online demo-system you will only have read access to the dashboard and can thus not create new dashboards or change the demo dashboard. 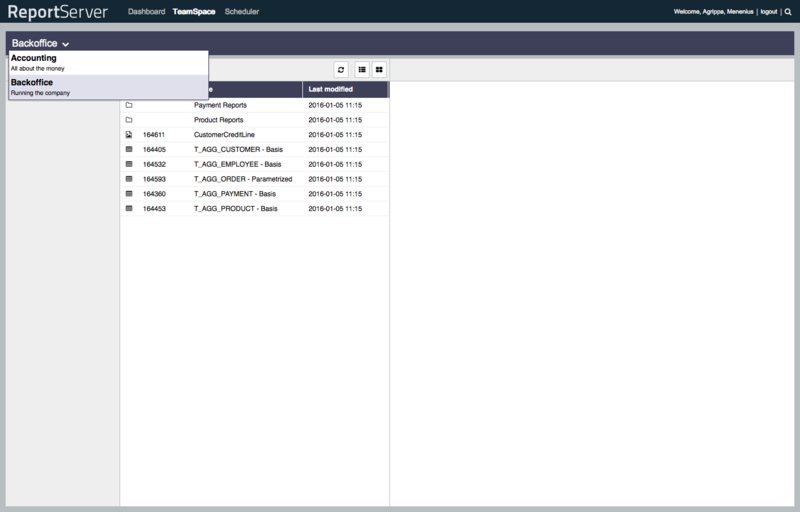 Besides the dashboard module the second important module for users is the TeamSpace. To change to the TeamSpace switch modules by clicking on TeamSpace on the module bar on the top edge of the screen. Gerard is part of the sales team and has thus access to the Sales TeamSpace. The Sales TeamSpace is a shared workspace for all employees of the sales department. Naturally there can be many TeamSpaces and users can have access to multiple TeamSpaces. We will take a closer look at TeamSpace later on in this introduction. Before we get to the TeamSpace note that the UI of ReportServer is structured into several areas. 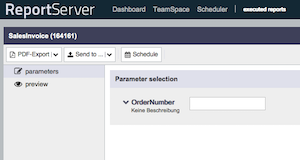 On the very top you find the module navigation which allows you to access various areas of ReportServer (you have already seen the Dashboard and TeamSpace modules; other modules are for example the Scheduler overview or the Administration module). On the top right you find a link to the user's profile allowing the user to change various settings. Next to the link to the user's profile you see a global search field. Beneath the module navigation you will see the currently active module: in our case the TeamSapce. The TeamSpace is again structured into two parts. The left part is modeled after the Windows Explorer and allows to navigate through folders to the various report objects. On the right you find detailed information to the currently selected objects. Dragging the border between the two windows allows you to resize the windows. Let us start with the execution of a dynamic list which is the ReportServer way of ad hoc reporting. 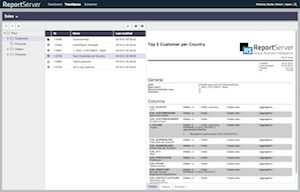 Access the folder Customers and open the report T_AGG_CUSTOMERS - Basis by double clicking its icon. This report accesses an aggregate table in the warehouse and allows the user to freely configure which kind of data from that table he or she wants to select. Click on apply to confirm the selection. You should now be back in the list configuration view and the two columns should have been added to the configuration. To view a preview of your report click on "preview" in the left column. The preview view displays the first 100 data-records and provides some metadata at the bottom. The bottom toolbar also allows you to page through the data. Via right click on data cells you can access several functions such as sorting, filters and formats. These and additional functionality can also be accessed from the list configuration view ("configure list" in the left column). To see a record in detail, double click on it. To export your report into one of various formats you can click on "Excel-Export" (for Microsoft Excel) or on the little arrow next to it. 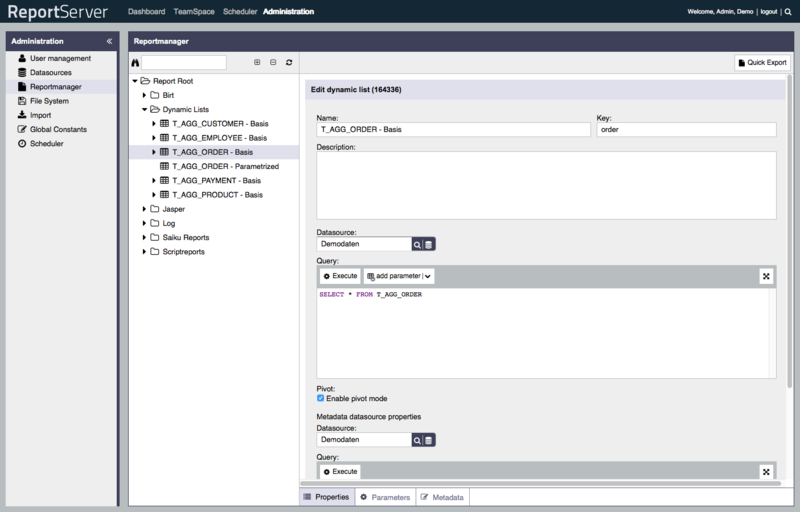 The configuration of a dynamic list (which columns, filters, aggregations, etc.) can, of course, be saved as a so called variant such that it can be easily accessed again at some later point. In the read-only demo system this functionality is, however, disabled. 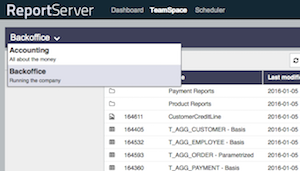 Now go back to the TeamSpace (click on Team Spaces in the module navigation at the top of the page) and select the report Customermap (located in the root folder of the TeamSpace). For selection, a single click is sufficient. A double-click, on the other hand, runs the report. 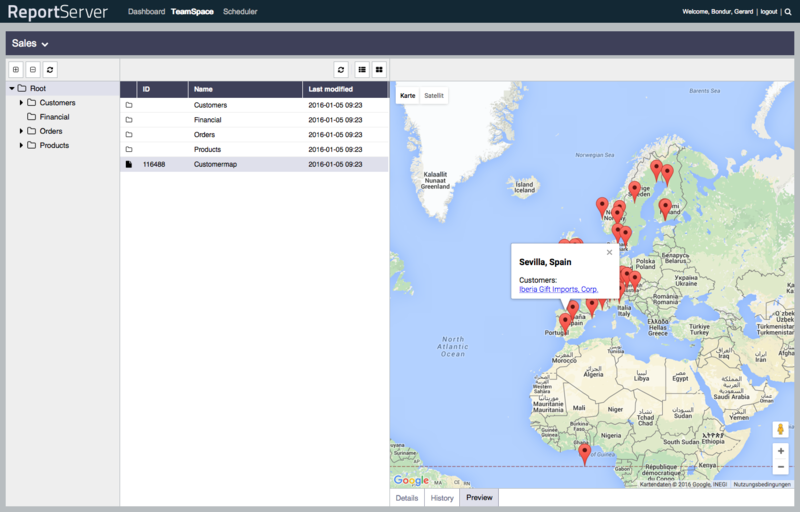 ReportServer's scripting interface allows to incorporate almost any kind of report format such as, for example, a view of the existing customers displayed on google maps. As you can see, additional information for a report including a preview of the report is directly displayed in the detail panel on the right hand side of the TeamSpace. Click on one of the customers to get some additional information and a link to a dynamic list displaying detailed information for that particular customer. If you click on the link you'll be forwarded to that dynamic list. Notice that the new report is opened in a tab which allows you to easily go back to any previously opened report. To close a report click on the cross icon on the upper right or on the tab (at the bottom). ReportServer integrates the jXLS library which allows users to directly export data into a preconfigured Excel template thereby bridging the gap between simple list like reports and highly formatted reports such as as Birt, Jasper or SAP Crystal Reports. To get a feeling of what can be achieved using Excel templates go back to the TeamSpace and open the report OrderReport Template (located in the Customers folder). Then click on "Template-Export". You are now logged in as Menenius Agrippa, a user who has access to two TeamSpaces. Go to the TeamSpace module. 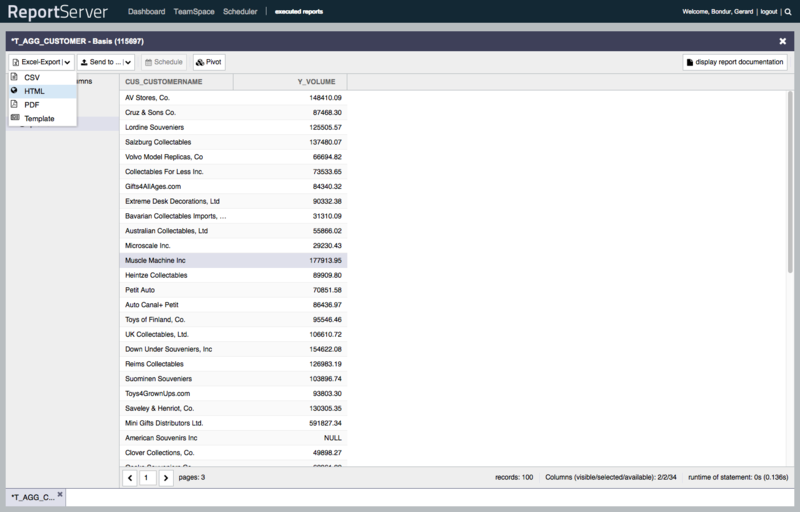 In the upper menu bar of the TeamSpace you can switch between the TeamSpaces for the Accounting and Backoffice divisions. In addition to the ACL based permission management used throughout ReportServer, TeamSpaces have a simple role based access scheme. In the demo system all users are assigned the guest role and thus have read-only access only. 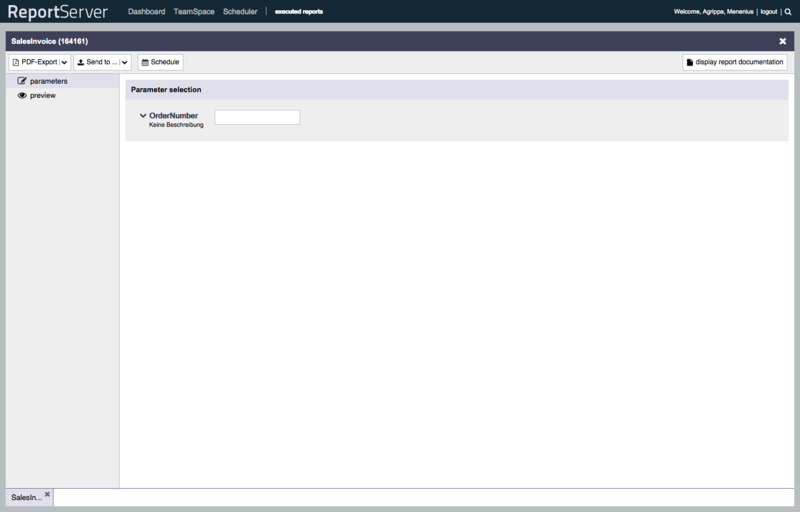 The roles user and manager allow users to make changes in the TeamSpace (e.g., add reports) and to manage who can access the TeamSpace. With this, TeamSpaces provide a flexible view on the data without disturbing the administrative structure which can only be accessed by administrators. Managing permissions (who can access which reports) is an administrative task which sets an upper bound on the data that can be accessed by a single user. That is, even if a user is given permissions to access a TeamSpace he or she might not have the access to access all reports in this TeamSpace. 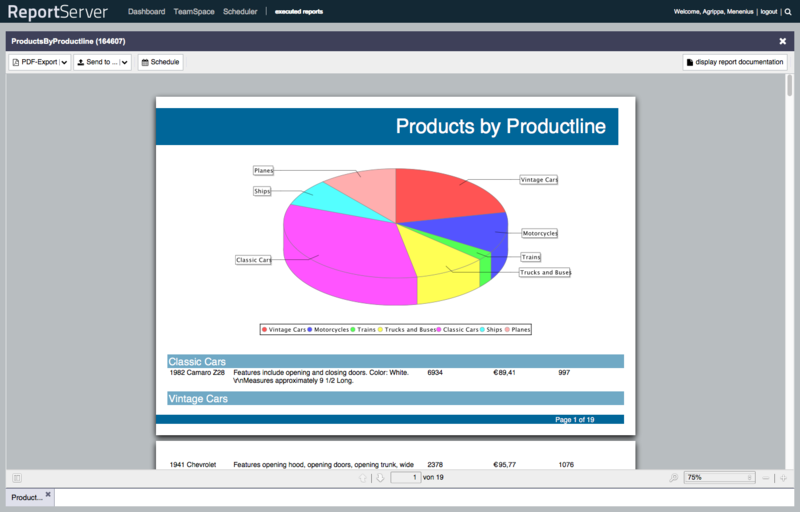 Now switch to the TeamSpace Backoffice and open the ProductsByProductline report (in the Product Reports folder). This is an example of a graphical report created using the JasperReports library. 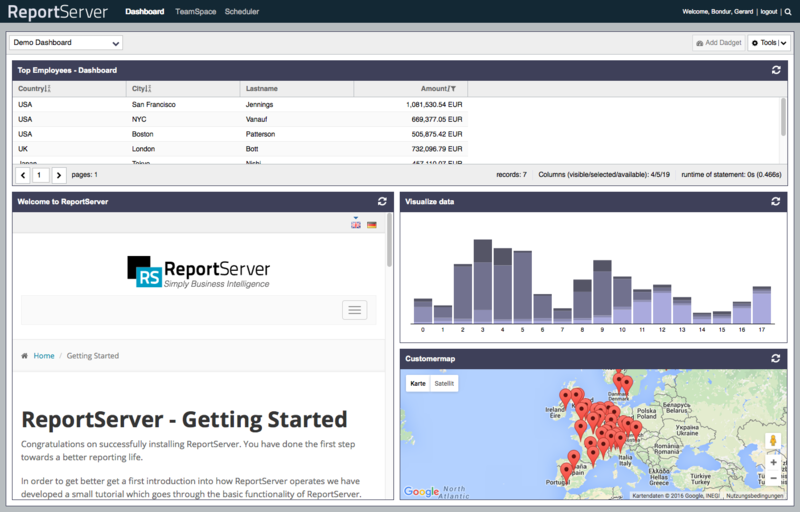 ReportServer seamlessly integrates report types and engines of different vendors, which allows administrators to chose the engine that caters best to their current needs. 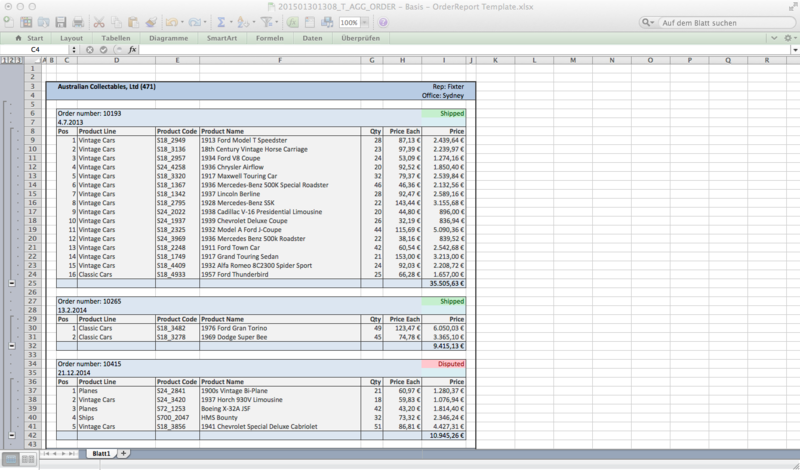 Besides JasperReports, ReportServer integrates Eclipse BIRT and SAP Crystal for pixel-perfect reporting. 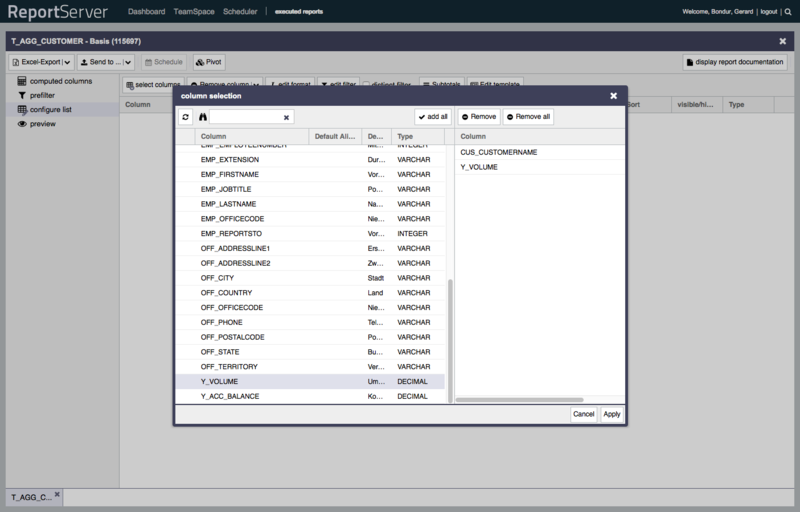 Go back to TeamSpaces and select the Accounting TeamSpace. 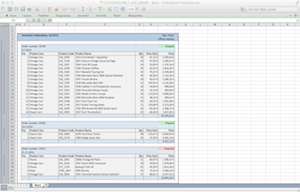 Open the folder Sales and execute the report SalesInvoice. This is an example of a parameterized Eclipse BIRT Report. 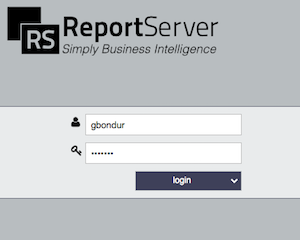 Every report type in ReportServer can be parameterized to allow users to adapt the displayed data. Various types of parameters provide a comfortable and integrated user experience. In this case you see a simple text input parameter. Insert the order number 10100 and select preview (in the left column) to get a preview of the report. Select the administration module from the module navigation (on the top). Users, reports and data sources are all structured in a hierarchical tree structure. This allows for efficient management of objects as well as for a powerful permission scheme. The file server takes a special role. It contains resources used in reports (such as images) but also configuration files and ReportServer extension: scripts. These are used, for example, to customize the the user permissions in the online demo systems: for example users cannot change their passwords and scheduling is disabled. To get an idea about what is possible with ReportServer scripts, please have a look at the scripts active in the demo system as well as the scripting guide. The scripts are located in the fileserver in /bin/onstartup.d/. The script prohibiting users from changing their password is prohibitpasswordchange.groovy (this is only available on the online demo system). For a list of features please also have a look at the ReportServer documentation. If we have piqued your interest, feel free to explore the demo system on your own or simply download the software and go through all the aspects without any restrictions. Also please feel free to contact us directly or via our forum. We are looking forward to hearing from you.